Bethena Thompson Wilkinson from the collections of the Worthington Historical Society (WHS) may be used for educational purposes as long as it is not altered in any way and proper credit is given: "Courtesy of the Worthington Historical Society, Worthington, OH." Prior written permission of the WHS is required for any other use of Bethena Thompson Wilkinson. Contact WHS at info@worthingtonhistory.org to request permission. Bethena Thompson Wilkinson is an art original, with genre portraits. Its dimensions are 3.15 in. x 2.62 in.. 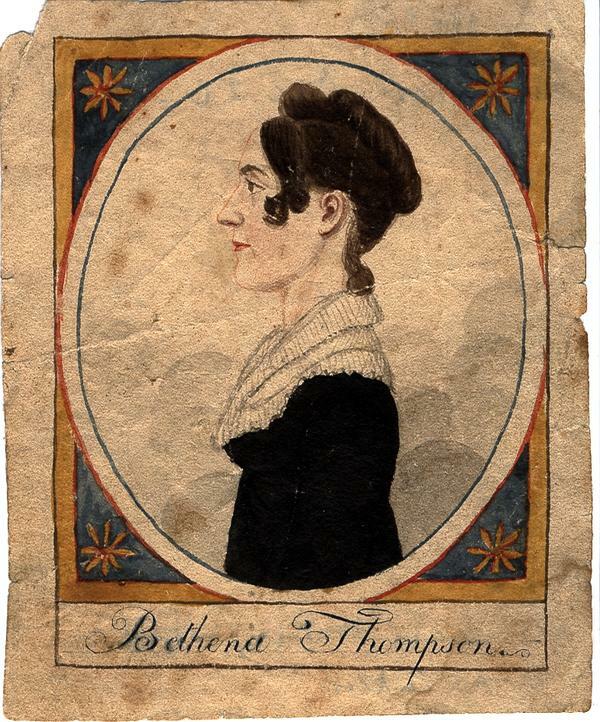 This portrait of Bethena Thompson (b. 1794, d. 1837) drawn on paper is an example of early Worthington paper craft. Bethena married Moses Wilkinson, a veteran of the war of 1812 on May 21, 1820. Wilkinson farmed in Sharon Township, north of Worthington. The Worthington Historical Society identification code is 55-L-182d (box Ephemera - Invitations). The Worthington Memory identification code is whs0803.